The cow is a four-legged domestic animal. It has a big body on thin legs. It has pair of horns on its head. It has long tail and big ears. Cows are mostly white and can be found in different colours. A baby cow is called a calf. It lives on grass, straw, fodder, and corn. It gives us milk. Its milk is very nourishing especially for kids. Its dun is used as manure. Its male ‘ox’, ploughs fields, drives our cart and works our wells. The Hindu worships her, and has a special significance for Indians. 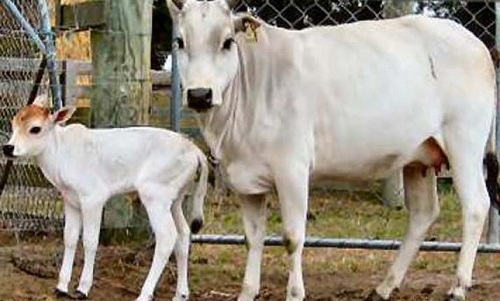 They call the cow ‘ Gau mata – mother’. Colour: Cows are of different colours. Generally they are white, brown, some are red, some are black and spotted. They are of different colours. Size: Generally they are four feet in height. A common Indian cow is a lovely creature. She has four legs, two horns, two eyes and a long tail. Food: She eats grass, straw, corn, vegetables, fruits and oil cakes. She is pure a pure vegetarian. She likes to eat green vegetables and breads. Habits: She is very gentle. She doesn’t hurt anybody. She loves small children very much. She likes to eat breads from their tiny hands. So they like to play near her. After eating food, she then begins to chew the cud. Usefulness: She is very useful to us. She gives us milk. Her milk has natural sweetness and very tasteful. He milk is a boon for the weak, sick and old. It is scientifically proves that Cow milk is a perfect diet. We use cow-dung as a fuel and manure in the fields. In many part in India, they are also used to draw our carts. They carry heavy loads from one place to another. Even after her death, every part of her body is used. The skin is used for leather; brushes are made of her hair. Her horns are used for making buttons and combs. She is the most useful animal in the world. She has special significance for Hindus. 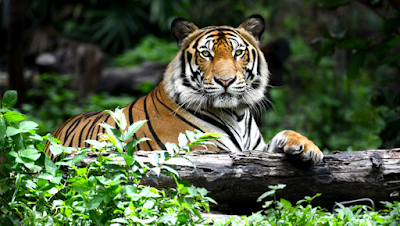 Indians worship her as a sacred animal. Every Indian is proud of keeping her. Cow has big body, four thin legs, two big ears, two eyes, long tail and two horns. It is a pure vegetarian, it leaves on grass, fodder, vegetables etc. Baby cow known as calf. She is the only the most useful animal in the world. Its milk has natural sweetness & very taste. Here is a list of lesser known facts about Cow, some facts you might have heard of it and the rest are new. An average cow produces 70 lbs. of milk approx. 8 gallons per day! An average cow chews at least 50 times/minute. The average sleep time of a domestic cow is about 4 hours/ day; unlike horses, they don’t sleep standing up. Just like dogs, cows enjoy a good rubdown, on the head, back and back. Cow has colour blindness to red colour, she is unable to see the colour red; the red flags used by matadors only catch a bull’s attention because of the movement. Cows approx. spend 10 to 12 hours/ day lying down. An estimated that cow chews at least 50 times per minute.